Given some recent changes in the canning market, I thought it would be helpful to outline the key facts/figures related to craft brewers and cans. For years, craft brewers relied heavily on two package formats, bottles and draught. However, over the past few years, cans have been increasingly integrated into the craft packaging mix. Why have cans increased in adoption, how large can the market for craft cans get, and what are future growth opportunities and challenges? Many of the reasons that craft brewers are switching to cans are now well known. New occasions: from the beach, to hiking, to golf courses, cans often are able to go places bottles can’t. 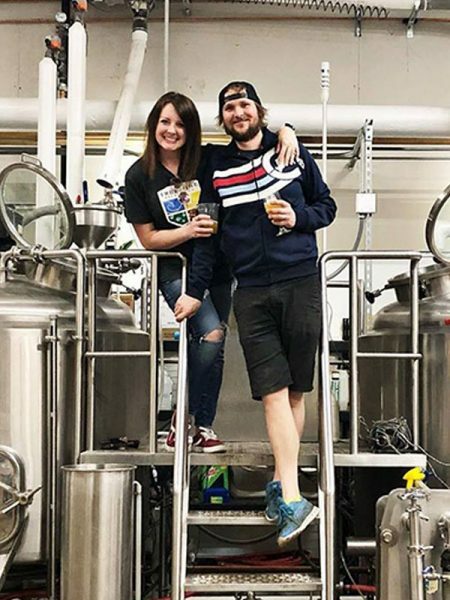 As craft lovers demand beers from their favorite brewers in these occasions, brewers would be foolish not to take the opportunity to expand the places they are offered and the places beer lovers can take their beers. Sustainability: cans are lighter than bottles, reduce CO2 emissions in shipping and are incredibly recyclable (did you know a recycled can could be back on the shelf in 60 days?). Freshness: cans block light and are an effective barrier to oxygen, meaning the only thing limiting the freshness of the beer in the can is the time it takes to get from the brewer to a beer lovers mouth/glass. Innovations: while many brewers previously eschewed cans due to limitations in the technology, new innovations have craft brewers taking a second look. These include new package designs from new lips that accentuate aromatics to removable lids that turn the can into a glass, to new format sizes, and even re-sealable cans. Changing consumer perceptions/preferences: the root cause of most changes in the marketplace is consumer demand, and cans are no different. Some of these changes have been driving by proactive education from brewers as well as high-profile can-only breweries. 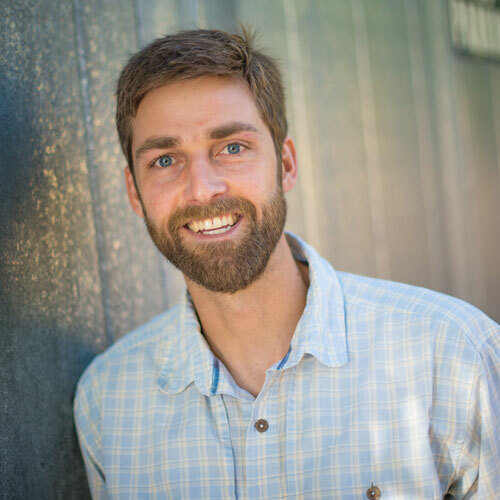 Business innovations: from new companies providing smaller scale canning lines aimed at craft brewers to mobile canners that reduce the capital required to enter canning, numerous supplier industries and business innovations have made it easier for craft brewers to enter the can market. That 20% of overall growth coming both from new breweries that have packaged almost exclusively in cans as well as brand extensions from companies that previously only used bottles. Although the BA benchmarking survey only found 10% of total volume in cans, the high number of large micros and smaller regionals with greater packaged volume in cans than bottles suggests that this percentage will continue to rise in future years. The vast majority of this volume still takes the form of 6 packs of 12 oz. cans, but there is also increasing diversity in can formats. 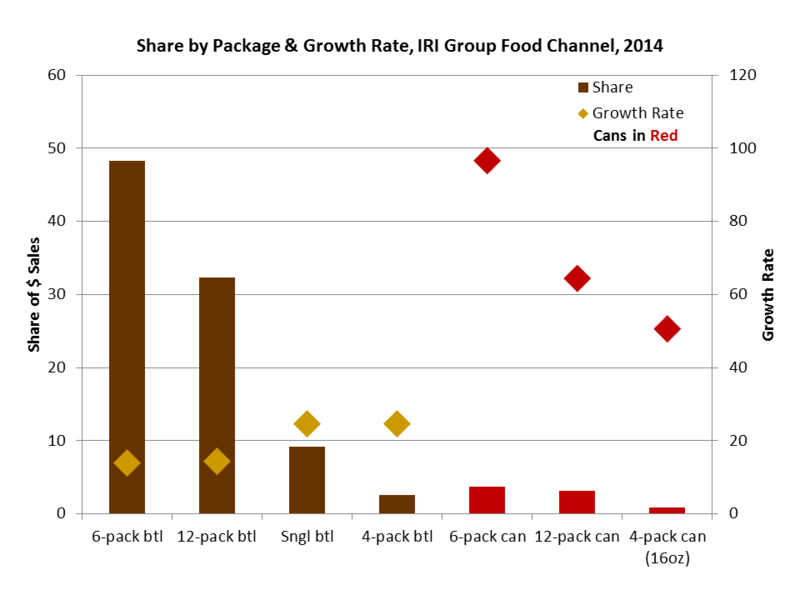 The chart below shows craft share and growth rates in 2014 based on supermarket data from the IRI Group. Although cans are still a low percentage of overall growth dollar sales, their tremendous growth rates suggest that gap may close rapidly. There are numerous reasons why I expect the shift toward cans to continue in the medium term. The overlying theme is that the beer business is predominately a can business, and many of the larger trends in craft demonstrate that the craft industry is slowly drifting toward overall industry averages (at the same time it pulls some of those averages closer to craft). 55% of total beer volume going through cans, so as craft occupies a larger share of overall beer and brings more beer lovers into the craft category, it is only natural that some of that growth will come from adopting practices in the larger industry. 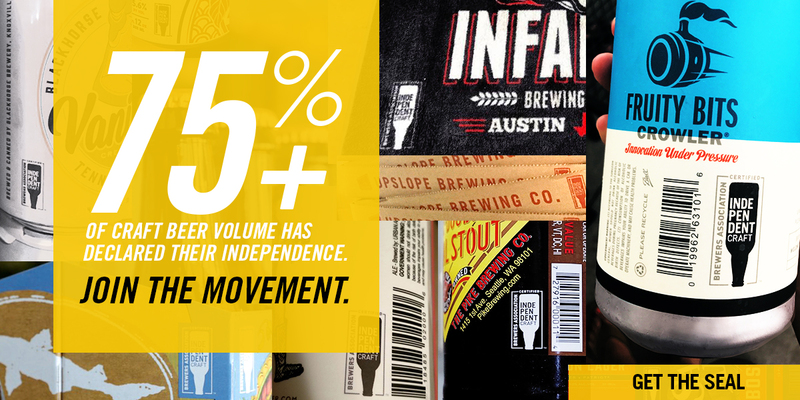 The convenience channel: craft has slowly established a foothold in the largest volume channel for beer, and is now seeing rapid growth. As craft diversifies its pool of consumers, I expect its share in convenience to continue to rise. Moving into convenience will also require craft to continue to use new formats, as single-serve larger format cans are a strong player in convenience. Craft as a sessionable/volume business: many of the fastest growing craft styles mirror the sessionability of the broader beer market. I’ve already highlighted many of these styles (session IPA, pilsner, gose, etc. ), but with sessionability comes the opportunity for higher volume sales/formats, many of which will likely be in cans. Given that these are new opportunities, it is highly likely that much of the growth in craft cans will be incremental, rather than cannibalizing existing bottle cans. Where brewers are able to offer brands in both packages, there may be some trade-offs, but I expect the growth of craft cans to be a net positive for category growth, rather than simply a shift in package share. One of the largest major remaining challenges is consumer perceptions. Although perceptions of canned beer have improved among craft lovers, and this was listed above as a reason for can growth, many craft purchasers still view the can skeptically. Based on recent data from Nielsen commissioned by the Brewers Association, the can has a ways to go with many beer lovers to match the bottle as a format synonymous with quality and freshness. Source: Nielsen (2015). Remainder responded “N/A, haven’t thought about it”. These findings are virtually identical when filtered on weekly craft drinkers as opposed to the general craft drinking population. The fact that 40% of craft drinkers answered ‘cans’ or ‘either’ for each question represents progress, but this data shows a pretty clear tilt toward bottles on both questions. Some of this may be weighted by the fact that many craft brands are still available only in bottles (bottles account for 60% of craft volume versus can’s 10% share). Even so, given these findings, it is pretty clear it will take some time before cans are viewed equally with bottles on quality/freshness for many drinkers. The perception challenge is perhaps one of craft’s own making. By being slow to enter the can format, craft brewers were signaling to craft consumers that fuller-flavored beer tended to come in bottles, versus American lagers and light lagers, which were predominantly in cans. Echoes of this fact are certainly a major driver of current perceptions. A second set of challenges are market access issues. I see at least two major areas here. The first is simply access to cans and the ability to can for many small brewers. In comparison to other materials, craft is still a very small purchaser of cans even within beer (~2% of the total canned beer market, compared to closer to ~20% of the bottled beer market and ~35% of the hop market). When placed in the context of the overall beverage market (including soft drinks, etc. ), craft brewers influence shrinks even further. Unlike a raw material like hops, beer producers also compete for access to cans with other beverage producers. In 2013, the Can Manufacturers Institute reported the shipment of 75.851 billion 12 oz. cans. That’s the equivalent of 229 million barrels, or a greater volume than the entire beer industry (which is roughly 55% cans by volume). Total shipments were almost 94 billion cans. In that context, craft brewers use well below 1% of the total volume of can production in the U.S. Consequently, demand shocks to the manufacturing system may leave craft brewers more vulnerable than other larger consumers of cans. This challenge has become particularly apparent in the 16 oz. format (about 12% of total craft can volume according to IRI). Although the package has provided strong differentiation and growth opportunities for many brewers in recent years, its small scale within the overall can manufacturing industry and the increased demand from other beverage products such as energy drinks may limit the ability of smaller brewers to enter into or grow within the 16 oz. can format. None of the above even touches on the difficulty of entering canning for many smaller brewers. Unlike bottling, which can be done by hand and at lower volume, canning requires a level of scale and capital intensity that is above the production levels for many smaller brewers. Although innovations like mobile canning are reducing the barriers to entry, canning will continue to be out of reach for many of the smallest brewers simply due to the costs involved. The second area is access to shelf space. Off-premise retailers are increasingly recognizing the value and dynamism craft brings to the beer aisle. That said, for many smaller brands, it’s going to be a challenge to convince retailers to carry an additional SKU of a craft brand that they already carry in bottles. Although this problem will begin to decline as craft continues its increases in volume and velocity, it may mean that many craft brewers will have to decide “can or bottle” as they move into scale retailers in the short and medium term. To end on a positive note, the data above clearly show that many brewers are happily and successfully choosing “can” as the answer to that equation, and that increased consumer demand, market channels and brewer innovation will continue to provide incremental growth through cans to the craft category.